Ok, I'm kinda gitty right now. I don't know if its because I just got done working out but I have had a fun day. My day started off with a run. I met the girls at the steps this morning and it was nice to get back to them. I'm still trying to follow docs orders so I didn't run the steps but I did stand at the top of each flight and yell at the girls that were running them (nice yelling, you know the sweet kind of yelling.) One of them threatened to puke....that brought a really big smile to my face! They worked really hard at the steps and then we went out for a run. This I got to participate in. They had already worked their legs to death so I got to set the pace today. The first bit of joy came today when I got done running. My knee didn't hurt. After Friday's run I wasn't sure that I was going to be able to run without pain but today lifted my spirits. I think Friday was just an overuse problem. I had been on my feet the entire night before and was already tired so maybe that is why I was sore. So after my morning run it was off to work. When I got to work I had an email in my inbox. It was quite possibly the funniest thing I have read in my life. I got so tickled that I was laughing out loud and had tears running down my cheeks. One of the guys that I work with actually came into my office and asked if I was ok, then when he saw the tears he didn't know if I was laughing or crying and I was so torn up that I couldn't even explain to him what was so funny. I cant post them email here but I will direct you to the website and give you a little preview. The website is http://www.damnyouautocorrect.com/. 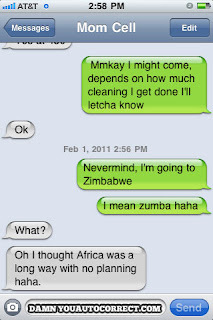 It is auto correct gone horribly wrong. 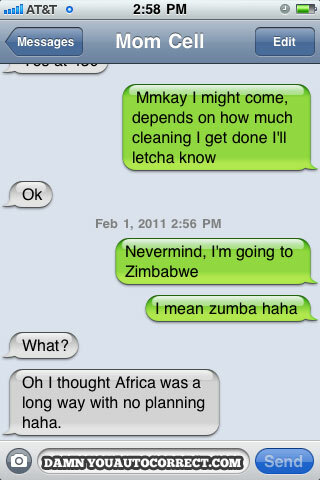 I thought this was appropriate because it had to do with Zumba! This site had made me smile all day long. Every time I look at one I get a little more tickled than the time before. So, late night workout was boxing tonight. I had a good time boxing and then my running buddy and I walked for a long time tonight. We apparently had a lot of catching up to do. Other things that have made my day great. 1. Karate Kid came on Instant Netflix. 3. My No Boundaries group starts tomorrow! I am getting really excited about this. 4. I decided it was more important to get in bed and blog than it was to pack my stuff for tomorrow. I am behind on sleep so I am sleeping tonight and I will pack my stuff up in the morning. I would ask for my hour back but I am so far behind at this point that I cant even count even count that high. 5. Yard Sale Hell is finally over. I made $18 whole dollars and it was so not worth it fun to spend time with my sisters. 6. I get to go roller skating tomorrow! I do love roller skating. Tomorrow I have Job #1, swim with swim buddy, Zumba, and No Boundaries, as well as roller skating with my babies at a church function. I will try (really try) to post before midnight tomorrow but no promises....its a really full day. I hope you had a great day today, if not I hope tomorrow is better.